A victim shares thoughts on how to deal with a stalker (by Wendy McElroy) – CHUBIBO! The experience of being stalked is more common than people realize, perhaps because most victims do not report the ordeal. Being stalked for years by a man with a history of violence against women taught me many things. The most important lesson is that I am responsible for my own safety. What is stalking? It is “the willful, malicious and repeated following and harassing of another person” — seems to be a growing phenomenon, perhaps because the Internet allows harassers to track people and to spread malicious rumors or misinformation about them with anonymity. Moreover, the Internet has a glut of accessible information on virtually everyone. For example, go to the AT&T directory and see how easily you can find the addresses of those you know, including maps to their homes. In my case, the harassment eventually crossed the line into criminal stalking — harassment that causes victims to feel reasonable “fear for their safety or the safety of anyone known to them.” Eliminating the stalking from my life required an attorney and an assistant district attorney. The second most valuable lesson I learned is that the victim is not to blame, and should never feel shame or embarrassment. People are not stalked because they have done anything wrong. They are victimized because someone in their lives — an ex-lover, a co-worker, a total stranger — becomes romantically or otherwise obsessed with them. In a sense, this is what makes stalking so frightening. There is little you can do to prevent it. All you can do is react after the fact. Rejecting shame is crucial because emotional confusion is a stalker’s most powerful weapon and it can prevent a victim from doing what is necessary for self-defense. In my long journey between receiving the first threatening e-mail and consulting the district attorney’s office, I took many steps that could be helpful to anyone suffering from persistent harassment to stalking. I hope the first steps will be all that are necessary. The first act is to say “no.” Tell your harasser in firm and unambiguous terms to stop the malicious behavior. But do this only once because the harasser is trying to get a reaction from you and repeated contact — even shouting “no!” — will encourage him or her. If the malice continues, cut off every point of contact. Return mail unopened. Create a “kill” file for unwanted e-mail. Hang up the telephone without responding. Refuse to discuss the harasser with mutual friends. Be scrupulous about your personal information. If the harassment turns into stalking, then drop everyone who maintains contact with the harasser. Open a private mailbox. Make your state motor vehicle department and other databanks know not to release your personal information. Do not discard your mail. Shred or burn it. Instead of changing your phone number, get a second unlisted one for friends and hook the old one up to an answering machine that can preserve a record of the harassing calls. (At work, have someone screen your calls and never accept an anonymous package). Equally, preserve the harassing e-mails that you direct to a “kill” file. Don’t delete them. In short, keep a meticulous record of every incident, from small ones like a drive-by to large ones like the killing of a pet. You will need that record when you go to the police; otherwise they will not take you seriously. If you fear for your safety, then the police departments where you live and where your harasser resides should be informed. A visit from a policeman might be enough, in and of itself, to make the stalking evaporate. If the police will not oblige, ask a hefty male friend to deliver a verbal but strong message. A restraining order can be issued against your harasser, but it should be viewed as a “paper” protection since most stalkers violate them. Indeed, some experts advise against restraining orders as stalkers may become enflamed by them. Last of all, talk to people from friends to family to support groups. Don’t go through the incredible trauma of being stalked by yourself. It isn’t fair. Victims shouldn’t have to turn their lives upside down and endure constant psychological trauma. They shouldn’t be afraid to answer their own phone, to download e-mails or to meet friends in a public place. Their families shouldn’t live under the shadow of a threat. 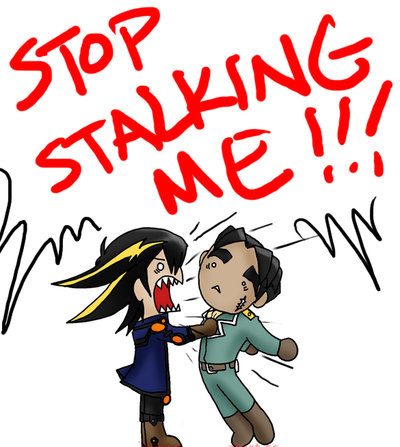 Nothing about stalking is fair. The third most valuable lesson I learned is to forget about demanding fairness because this leads to demanding retribution. The last you want to do is to draw out the experience by seeking “satisfaction.” Protect yourself, protect those you love, then walk away. Don’t give harassers the one thing they crave: your personal attention. Next postAng babaeng may wang-wang! This is a really nice, to-the-point article. Thank you, it has helped me with my own situation with being stalked.